Many wine enthusiasts love making their own wines. Because sipping a glass of your own beverage is rewarding. But should you use wine concentrate or juice? It depends. Yet, wine concentrate offers a quick and hassle-free solution for brewing your own beverage. If you’re not yet familiar with wine concentrates, this guide is for you. Alternatively, click on the links in the table below and check some of the most popular wine concentrates on the market. Alexanders Sun Country Wine Grape Concentrate..
Quite often we’re asked whether it’s better to make wine from fresh fruit or wine concentrate. While there are some differences between the two procedures, and also between the results, high-quality wine concentrate will still give you high-quality wine. Traditional winemaking is a complicated process that requires time, dedication, and knowledge. By simplifying the process, wine concentrate represents a great alternative solution for the inexpert winemakers. Wondering which is the difference? Read on! A few years ago, wine concentrates were made of poor quality juice and were rich in additives and chemicals. And for this reason, the concentrates have a quite bad reputation. Fortunately, things have changed and today it is possible to find high-quality fruit concentrates with little or no additives. This is a prerogative for achieving high-quality wine, and for this reason, wine made from concentrate is comparable with wine made from juice. So, since taste isn’t compromised by this choice, how to decide between the two? Well, we’d certainly recommend starting wine from grape juice. Although more complex, the traditional winemaking process is considered a culture. You’ll not only get to select the fruits yourself, but you’ll not need any other ingredients. However, unless you have a large basement or cellar, you’ll only be able to produce a small quantity of wine. Why? Because making wine from juice requires lots of fruits. For example, six gallons of wine require between 70 and 100lbs of fruit, depending on how juicy they are. At the same time, a packaged wine concentrate has about the same yield, and it comes in a small container. Wine concentrate also has other benefits. The most important, it’s easy to transform into wine. While the traditional winemaking process requires at least half a year, making wine from concentrate sometimes require less than a month. Perfect for beginners, these wine kits come with comprehensive and detailed instructions on how to make the wine. And in most cases, they don’t even require the use of other ingredients. Therefore, whether you’re a beginner or an expert with a lack of space, wine concentrate can give you the same tasteful beverage you would achieve from fresh fruit. It might seem simple, but it’s not. Not all wine concentrates are the same. 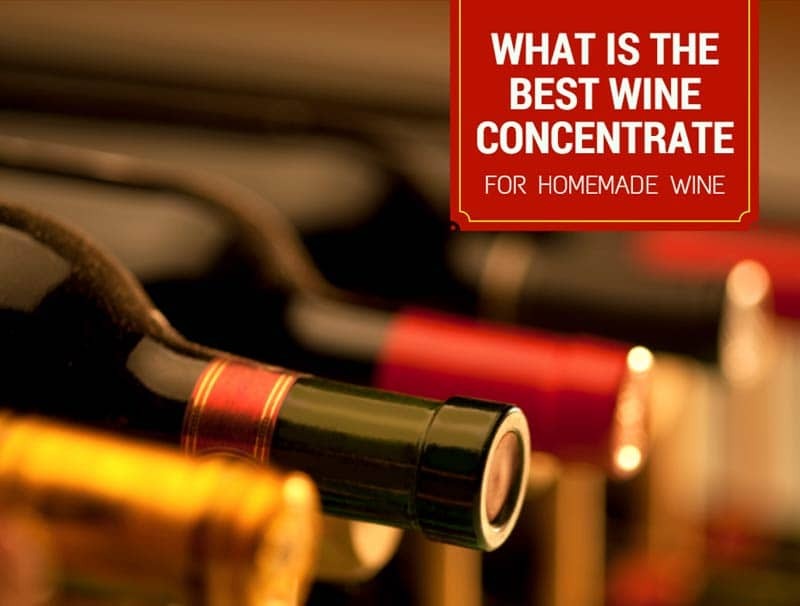 And to obtain quality wine, you need to use a quality concentrate. There are dozens of brands and wineries producing their own fruit purees or concentrates, but to make sure you buy the best, check the manufacturing process. The high-quality concentrate is obtained from the evaporation of water from the juice. This is usually done at room temperature, in a controlled and pressurized environment. Another way of achieving quality concentrate is by distillation. In any case, the product shouldn’t have additives or preservatives. The safest way is to buy concentrate made by a renowned winery or juice manufacturers. Another thing to decide is the type of wine you want to make. Grape concentrates are the most popular, but wine can be made of a host of different fruits. For example, you can make strawberry or blueberry wine. As far as grape wine is concerned, you’ll find generic concentrate (i.e. white wine or red wine) or varietal-specific concentrate. In the first case, the concentrate is made from a blend of grape juices and it’s almost impossible to track the provenience of the grapes. Yet, the manufacturer might disclose the varieties of grapes involved. In the second case, the box should contain only varietal-specific concentrate. The concentrate might still be made of a blend of juices but they all come from the same variety of grapes. Some selected wine concentrates are made from juice that comes from specific vineyards. This allows you to obtain a specific type of wine, for example, Barolo wine from Piedmont or Napa Valley Cabernet Sauvignon. These wine concentrates are usually more expensive but give the highest quality wines. Winexpert is one of the most renowned brands of winemaking kits. They have a wide range of grape juices and wine concentrates, and their Vintner’s Reserve collection is probably the most appreciated in terms of quality and price. As we said, there are many options to choose from. But we believe a Cabernet Sauvignon might be the right choice for the beginners. It is a wine loved by many, easy to make and with a great body and flavor. The kit contains everything needed to make 30 bottles in about two months. When we mentioned everything needed to make the wine, we meant the grape juice and oak chips. Thanks to the latter, the wine will achieve the bold and deep character of Cabernet Sauvignon, letting you brag in front of family and friends. The concentrate has a rather short shelf life, of about a year. However, this is more of an indicator of quality than a downside, as it proves the concentrate has few additives. Choice: Winexpert proposes a wide range of wine concentrates and grape juices, while Vintner’s Reserve collection includes high-quality wines. Simplicity: making wine from this kit is a breeze. Just follow the manufacturer’s instruction to get 30 bottles of delicious Cabernet Sauvignon in less than three months. Directions: the concentrate comes with easy-to-follow directions and it includes oak chips, which add aromas and flavor to the wine. Origin: the grapes come from wineries in Canada. It seems 6 gallons of water may be too much for this concentrate. Carving for a different wine? Try blackberry wine. Sweet, refreshing, and perfect to pair with a wide range of sweet and savory dishes, this beverage might simply surprise you. 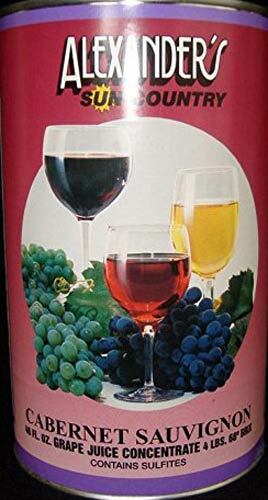 For simple winemaking, start brewing from Vintners Best Fruit Wine Base, Blackberry concentrate. This blend of juice concentrates contains corn syrup and citric acid, ingredients that create a perfect base to blend your wine at 18.9 Brix. The concentrate is also enriched with natural flavors that enhance the final bouquet of the drink. Vintners Best Fruit makes five gallons of high-quality wine. But what we really like is how easy to make this wine is. Thanks to the formulation of the concentrate, you won’t need to make any pH or acid adjustments, while the comprehensive instructions provide plenty information on the process. Moreover, the wine doesn’t need to be strained or placed in a mesh bag; the concentrate doesn’t contain any fruit skins and all you’ll have to do is dilute a gallon of fruit wine base with four gallons of water and wait for 6 to 8 weeks. Flavor: blackberry wine is almost as popular as grape wine; it has fruity aromas and a distinctive flavor which make it perfect for savory and sweet dishes. Easy to make: making wine from this concentrate is simple. Just mix the wine base with water and give it a stir. Reusable jug: the jug comes with a tamper-resistant seal and can be used to brew the wine or for various purposes. Quantity: the wine base is sufficient to obtain 5 gallons of wine or about 25 bottles. The concentrate contains a quite low concentration of sugar. Want to give a twist to your regular Chardonnay? 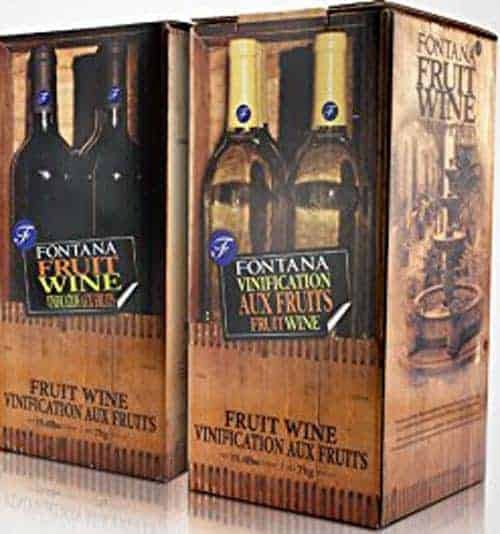 Try Fontana Fruit Wine Making Kit Premium. This brand combines the famous wine varietals with juicy fruit flavors and the wines produced are sweet yet maintain their clean and crisp Chardonnay taste. There are 8 flavors to choose from, but we believe that Peach Chardonnay is unbeatable. The association between the two is flavorful, making this wine perfect for most white wine cocktails or appetizers. Coming as grape juice concentrate, the wine is easy to make. One kit produces 6 gallons of finest quality wine, which equals to 30 bottles, and the step-by-step instructions allow anyone to make this beverage. the concentrate is sterilized and aseptically packaged. The kit doesn’t contain any bottle labels, but it does come with all ingredients needed to make delicious wine. This includes potassium metabisulfite and all the other substances needed to brew the beverage. Quality: all ingredients included in this kit are 100% food grade and OGM-free; the main ingredients are grape concentrate and peach flavor. Quantity: this concentrate yields 6 gallons of wine, or about 30 bottles of 750ml each. Choice: besides peach chardonnay, the manufacturer proposes an assortment of other flavors which include green apple, raspberry, tropical fruits, and pear. Instructions: the wine concentrate comes with step-by-step instructions. All aromas used are natural and the manufacturer doesn’t use any artificial flavors. The instructions could have been more detailed. Winexpert White Grape Concentrate is not exactly a wine concentrate, as it’s not recommended to use it to make wine from scratch, but more of a sweetener for already made wine. The concentrate is three times regular grape juice and it has a Brix of 68. This white wine grape concentrate is used majorly to increase the alcohol concentration and the body of a wine, therefore it can successfully be used for homemade Port or Marsala. The strong grape taste will also add flavor to a dull wine. Although some claim it’s possible to make wine from this kit, we wouldn’t recommend it. The concentrate doesn’t include any stabilizers and it can create carbonation if the bottles are not properly stored or stabilized. Sadly, this can happen even if you use it as instructed. For this reason, it is recommended to stabilize your wine before adding this grape concentrate to the beverage and to store the bottles in a cool place, away from temperature fluctuations. Flavor: this wine concentrate is sweet and flavorful, perfect to enhance the aromas of a homemade white wine. For fortified wines: if you’re aiming to make a fortified wine at home, this grape concentrate can help you achieve your purpose. Multiple purposes: as mentioned, this is regular grape juice. This means you can use it to replace white wine in recipes, especially if you have kids. 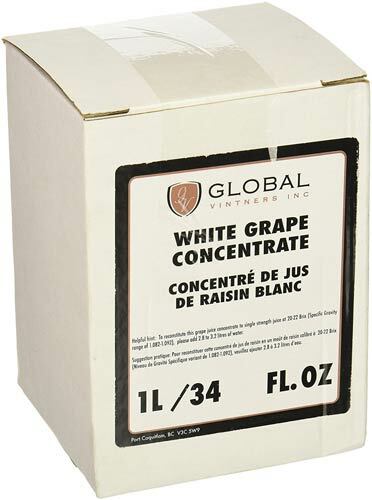 Concentration: this grape concentrate is three times the regular juice, which means a small volume is sufficient to add body and flavor to a wine. This isn’t wine concentrate but a wine conditioner. Alexanders Sun Country Wine Grape Concentrate is a 68 Brix concentrate similar to the grape concentrate above, but the producer claims it can be used to make wine from scratch. The concentrate should be diluted 1:3 if you plan to use it for this purpose, which means a single can will only be enough for a very small batch. In fact, the concentrate comes in 46oz cans, meaning you’ll roughly obtain 1.5 gallons of wine. Maybe this is enough to start with and see if you like the wine, in which case you can purchase multiple cans for a larger batch. What we like, however, are the ingredients. All Alexanders Sun Country Wine Grape Concentrates are made of 100% varietal specific grape juice. This concentrate is made of pure Cabernet Sauvignon grapes and the brand proposes concentrates on almost all types of wines. Ultimately, this concentrate is suitable for multiple purposes. You can use it to add sweetness and body to a red wine or to cook. Content: this grape concentrate is made of 100% pure Cabernet Sauvignon grapes and it has a 68 Brix sweet level. Use: the concentrate can be used to start the wine from scratch, to add sweetness to a wine, or to use instead of wine in cooking. Canned: this concentrate comes in a can, which is convenient for many reasons. Choice: made of 100% pure varietal juice, the brand proposes a concentrate for almost all types of wines. The can hold only 46oz of concentrate, which is too little for making a full batch of wine. 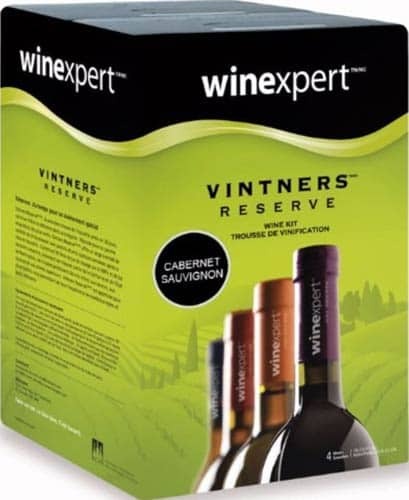 There might be dozens of choices out there, but in our opinion, Winexpert Vintner’s Reserve is the best. This winemaking kit yields 6 gallons of wine, which corresponds to 30 bottles of 750ml each. The Cabernet Sauvignon kit contains everything needed to make the wine, including oak chips that add aroma and flavor to the wine. On the other hand, the kit comes with comprehensive instructions that are easy to follow, while the wine will be ready in about two months. Compared with wine started from fruit, this is surprisingly fast. Although the manufacturer recommends aging the wine, you’ll still be able to uncork the first bottle in less than a year, which is awesome. Moreover, this kit is perfect for beginners. Apart from Cabernet Sauvignon, the brand proposes much other wine concentrates, including varietal and generic blends. As for the downsides, the kit could have come with bottle labels and it has a short shelf life. Ultimately, this is a guarantee of the quality of the ingredients, so this is definitely a wine concentrate to consider.